This professional grooming table is perfect for your pet dog or cat. With the hydraulic system, the table will raise the height of your pet so that you can reach him easily for bathing, trimming, drying, grooming or other pet care. The ribbed rubber surface of the table ensures your pets'safety. The rugged surface makes it easy to clean and remove hair and debris. The clamp-on adjustable grooming arm and security noose make it easier to groom your dogs and kitties. Made with a solid iron frame, the table is sturdy and durable for years. 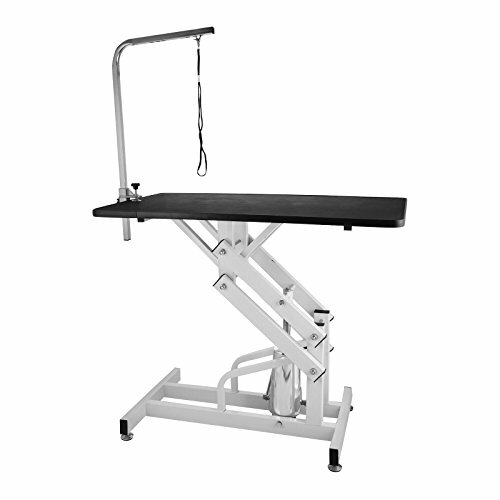 Table height from the ground: 21.3" - 36.6"
Height of Adjustable Arm: 31"
Hydraulic grooming table tabletop size: 42.5" (L )x 23.6" (W).Table height adjustable range: 21.3" - 36.2".